Family-friendly brunches are dime a dozen in Dubai, but if you're looking for something unique, where you can get together every Friday and enjoy a spectacular culinary experience, Conrad Dubai's Ballarò is the place to be. At this popular venue in Dubai's Trade Centre district, culinary magic takes centre stage. The sheer selection of dishes, spread across live cooking stations and buffet counters, is sure to leave you overwhelmed. Think everything from Latin American ceviche to Mediterranean antipasti. If you're a self-proclaimed foodie, make sure you don't miss out! 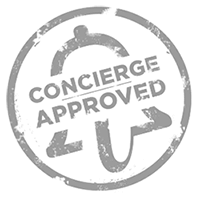 Book your experience online now as a myconcierge member. The indoor dining area at Ballarò boasts a pleasant ambience with the bustle of live cooking stations. During the cooler months, feel free to venture outdoors for a relaxing poolside dining experience. The house band, with its pianist and singer, keeps you entertained with mellow tunes all through the afternoon, making for the perfect laid-back weekend brunch. When it comes to taking your pick of food, delight your taste buds with the gourmet selection of dishes on offer. Help yourself to a variety of Spanish cured meats, farm cheese varieties, fresh pastas and risottos, grilled fish and meat and more. There's also a carving station at this Friday feast offering roasted lamb and beef with vegetables. Diners can also choose from classic Arabic, Indian and Japanese specialities. For dessert, take your pick from an overflowing assortment of everything sweet. Brunchers looking to make the most of their time at Conrad Dubai can also book a day pass to the hotel's urban oasis, Purobeach. Here, you can lounge by the pool, take a leisurely dip and also enjoy a round of refreshing sundowners. The hotel also offers a range of other exclusive dining experiences, which include Ballarò's Street Food Night on Wednesdays and Cave's Bon Appetit menu, served every Saturday, featuring succulent black Angus sirloin steak paired with a free flow of wine.